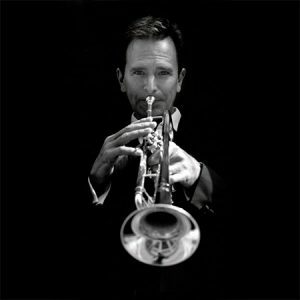 Gavin Wells was born in London, but studied trumpet performance in the USA at the University of Northern Colorado under William Pfund. He later received his M.Mus degree from the Florida State University, where he was also a trumpet teacher. In the USA he was a member of the Rocky Mountain Brass Quintet, the Cheyenne Symphony Orchestra, and the Disneyland Show band. In 1986 he won the International Trumpet Guild Solo Competition held in London. Settling in Gloucestershire in 1989 he now teaches Brass and enjoys a busy freelance career, performing regularly with the Bath Philharmonia, the West of England Philharmonic Orchestra, the Bristol Ensemble, the Regency Sinfonia, and the Premiere Brass Quintet. He regularly records for BBC television and radio and has recently performed with the London Symphony Orchestra and the Singapore Symphony Orchestra. Gavin has given recitals in Gloucester Cathedral and Bath Abbey with organists David Briggs and Peter King, and as part of the Guiting Festival in 1997, and the Three Choirs Festival in 1998. As a soloist he has performed the concertos of Bach, Vivaldi, Haydn, Hummel, Neruda, Tomasi, Arutunian, Copland’s Quiet City, and Shostakovich’s Concerto for Piano, Trumpet, and Strings. He has recently recorded concertos by Telemann, Mudge, and Vivaldi with the Bristol Ensemble.